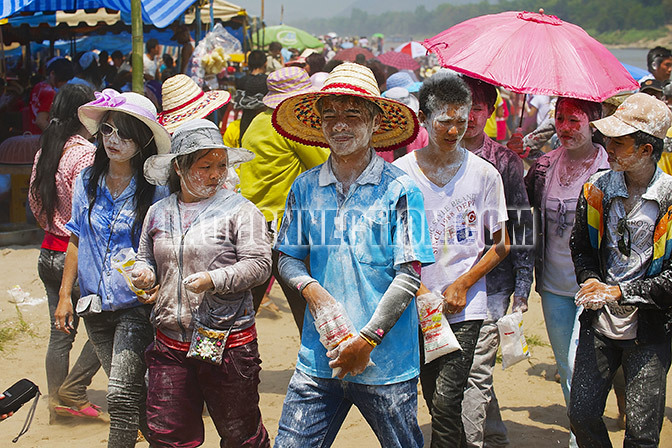 A part of the Lao New Year celebrations includes the Water Throwing Festival ບຸນຫົດນ້ຳ. Over the years in some parts of the country it's morphed into something quite different as participants seek to douse each other with something other than water. Beware of this. The simpler days of just throwing water at each other among the crowds has made way to other more creative things to throw as people have been known to throw flour (as seen in the photo) or baby powder, smear lipstick or makeup, and in some cases, mix ice and colouring with the water. Injuries have been known to occur and sometimes fights and arguments do break out. Some cities have become more strict in what revelry they allow during this festival and police are directed to be vigilant. For the most part, it remains a fun event during Lao New Year. Stay safe. Stick with water. Try to go with family or friends in case you get hurt you'll have back up. If it gets too rowdy, then leaving the area would be advisable.